USA – The American rider organisations the MRF – Motorcycle Rider Foundation and the AMA – American Motorcyclist Association have been fighting against motorcycle-only checkpoints. Motorcycle-only checkpoints first appeared in New York in 2007 and lead to funding for these checkpoints being provided by the National Highway Traffic Safety Administration – NHTSA which included “targeting” motorcycle events were thousands of riders were riding in to attend. 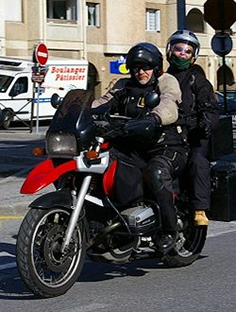 In 2011 the federal government funded motorcycle-only checkpoints through a $70,000 grant that’s around £45,000 or €61,000 in todays money. The NHTSA has argued that these checkpoints are a way to reduce motorcycle crashes. So how have the riders organisations been bringing an end to these checkpoints. Using legislative means they are with support from their politicians introducing legislation to end the federal funding of motorcycle only roadside checkpoints. The “Stop Motorcycle Checkpoint Funding Act” would restrict the Secretary of Transportation from granting funds to any government entity for a program to check helmet use or to create checkpoints for an operator of a motorcycle or a passenger on a motorcycle. Both the American Motorcyclist Association and the Motorcycle Riders Foundation fully support this federal bill. If passed, this federal bill will cut off NHTSA funding and ensure that riders across the country are safeguarded from these ineffective and discriminatory stops. Meanwhile back at the lobbying and political end of getting ride of this situation Congressman James F Sensenbrenner has just circulated a “dear colleague” letter to inform his fellow members of the House of Representatives that he will be soon introducing the legislation to end the federal funding of motorcycle only roadside checkpoints. The MRF, along with ABATE (A Botherhood Against Totalitarian Enactments) of Wisconsin met with Sensenbrenner earlier this week to discuss this important matter. The MRF obviously strongly opposes this sort of motorcyclist discrimination. “Pulling law abiding motorcyclists off the road does not make anyone safer is a waste of taxpayer money and is law enforcement harassment at its worst,” said Jeff Hennie. Both rider organisations are asking riders to engage their member of congress to gather as many cosponsors as possible to ensure passage of the bill on this important matter impacting motorcyclists on a national level.